Do you need to clean up your nutrition this month? I know that I have been indulging a little too often this summer so far- and it’s only just begun! I need some help and accountability! 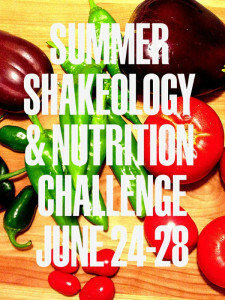 Join me for a 5 day Shakeology and nutrition challenge at the end of this month. There is no cost to join, all you have to do is buy your shakes (5 for $25) and choose from any of the 4 flavors available (Chocolate, Vegan Chocolate, Tropical Strawberry, and Greenberry). The official challenge will be June 24-28, but as soon as you sign up we will start small challenges and fine-tuning to get back on track before the 4th of July! Space is limited as I want to keep this group small, so let me know asap if you want to join the challenge! Drink a shake a day- let’s be real, who has time to cook from scratch every meal each day? Drink a shake a day instead of your ‘weakest’ meal to save time- and maybe money too! Take pictures of food eaten every day- you’re less likely to eat junk if you know you have to share it with the group. Snap a quick pic before you start eating and share in the FB group right away, quick and easy! Report how much water you drink each day- You should be getting about half your weight in ounces of water every day, plus more if you are exercising and/or it’s very hot/humid outside. Try a new recipe/veggie!- I will share some recipes, and everyone is encouraged to share as well! Previous Post:New in June- BOOT CAMP referral contest!